Our church has a daily Bible reading posted on our Facebook page https://www.facebook.com/cccwired?fref=ts this makes it very easy to spend time reading God's Word daily. Today's reading was all about fear. 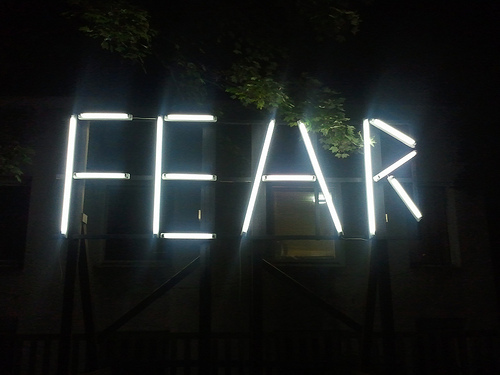 There are different ways to look at fear. I've said it many times, I have NO idea how people watch the news, see the suffering and listen to all the evil that fills the world without the saving knowledge of Jesus Christ! God is our refuge and strength, a very present help in trouble. Therefore we will not fear though the earth gives way, though the mountains be moved into the heart of the sea, though its waters roar and foam, though the mountains tremble at its swelling.—Your life is hidden with Christ in God. He is not afraid of bad news; his heart is firm, trusting in the Lord.